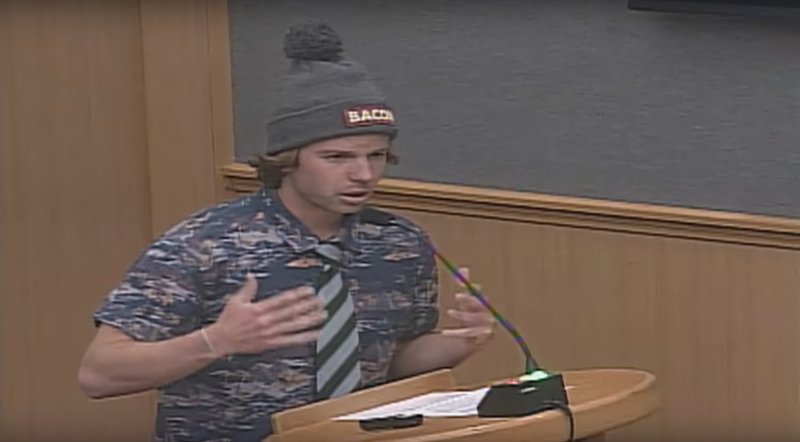 Two guys recently stopped by a city council meeting after a surf session in San Clemente, California, asking for a huge statue of the late Fast and Furious star Paul Walker to be erected as a “beacon of headlights that can guide us down a dusty road.” It is absolutely the best—and gnarliest—thing you will ever see. Update: Yes, it’s a joke. Meet your two new national heroes. One of them, Chad, greeted everyone with “What up council” while wearing a striped tie and a fuzzy hat with “BACON” written across the front of it. Chad, who said he’s a freelance journalist who’s discussed how divided the U.S. is with a lot of people, talked about how it’s the American dream to be able to go to a surf session and a city council meeting within an hour, thoroughly charming everyone before making his request. He then got to the serious stuff, telling the council that we’re all in the midst of “gnarly” times and we need Walker to guide us back into the light—a 12-foot steel statue of Walker on the pier, to be exact. Chad even gave the council the name of the artist he’d like to see sculpt it, and told them about the urgency of the matter considering that the new Fast and Furious movie is coming up. Chad’s friend went next, saying that “2017 has been a bummer year so far” and that the city needs this Walker statue as a beacon of light for the people. He apologized for stealing a line from Chad’s speech, but said it was just too good. He later read inspiring quotes off of his T-shirt. Really, it gets much better than that. Please just watch it for yourself. Chad and his dear friend come to the council meeting at 30 minutes, if the video doesn’t automatically start at that time. The video feed above may look like it’s from the late 1990s, but the City of San Clemente posted it on March 21, 2017. There is still hope for this world, even to this day, and that is a great thing. Update: In case you couldn’t tell, this is part of some kind of comedy routine, and a fine one at that. This originally said that our friend Chad discussed the statue with people, but he really discussed the divided state of the country with them. It was hard to keep everything straight through the laughing.